Two dog walkers crossing Port Meadow. Port Meadow is not far from our apartment in Oxford and has been a draw for a walk since I started looking at maps while still in Seattle. On Friday, we made the walk around the meadow, covering more than seven miles for the day. One of the signs along the way told us that the meadow may have been grazed for 4,000 years, never touched by plow, pesticides or fertilizers (not counting four millennia of cow pies). The hay from the meadow is highly prized. What we like is the quick escape to open space it gives us. We even found a new pub that’s an easy walk from the apartment and puts us in a country atmosphere. We seem to get a new favorite pub every day. The return trip on our walk today was along the Thames Path, which, as you might guess, follows the river. We met a couple of guys with crawdad traps and a bucket of plump specimens. They told us the American crawdad has crowded out the native Thames variety and that the rule is that you never throw back the American kind, even if it is too small to eat. Invasive species travel both ways. The two young men reported making a crawdad curry the night before. Coquettish nuns still haunt the Godstow Nunnery. The party stopped in 1541 when Henry VIII, on a tear to stamp out Catholicism in favor of his brand of religion and marriage equality, had the place destroyed. So much for girls just wanna have fun. 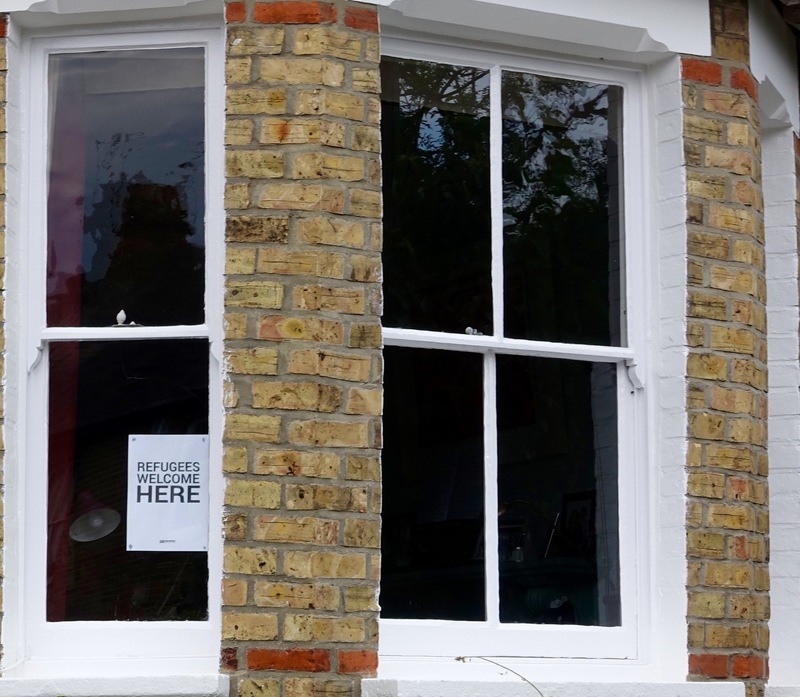 Our new favorite pub is The Perch in the village of Bisney, just a stroll across the Rainbow Bridge, up along the Thames and through the bower into a warm. low-beamed interior and an outside space filled with picnic tables. An uninvited guest sneaks up on our picnic. 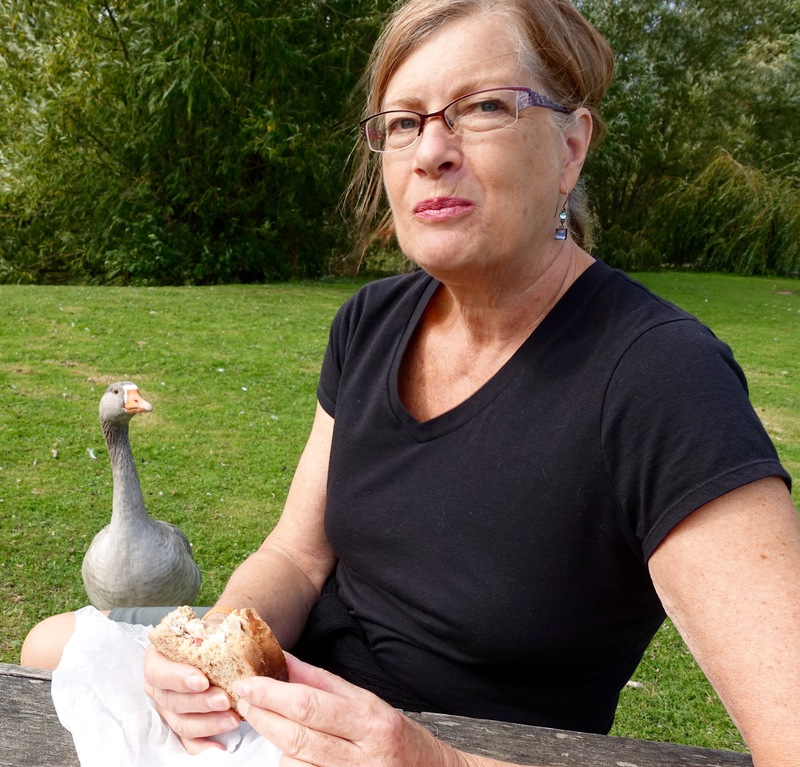 Speaking of picnics, we took one with us today and ate at the Wolvercote Bathing Place. Some uninvited guests showed up for lunch, but we left them to wing it. No free lunch here. You know how Canada geese dirty up Seattle golf courses? Same here. The Thames Path is a wide trail along the river with several gates, probably to control where cattle can roam. The trees along the bank are huge, the waters plied by narrow boats and the trail shared by bicyclists, walkers, baby strollers and lots of dogs. We chatted with dog walkers, crawdad catchers and inn keepers. We nodded hellos to several others and exchanged smiles with all we passed. All and all, a friendly place. But there’s also division in the country over what to do about the refugees pouring into Europe from Syria and other Mideast and African nations. The plight of these people has been in the papers daily and what to do about them, how many to take, what effect they would have on housing and health care are questions that have generated a full deck of answers. Some say there is no room here. Others, like the person in an apartment near us, are happy to put out the welcome. Sign in a window near our apartment. 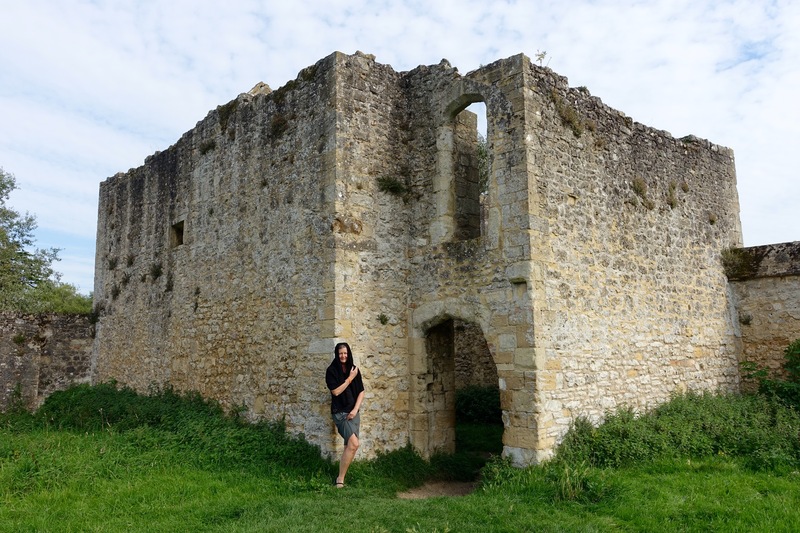 Posted on September 11, 2015 by jbsaulPosted in TravelTagged Henry II, Oxford, Port Meadow, Refugees, Rosamund Clifford.